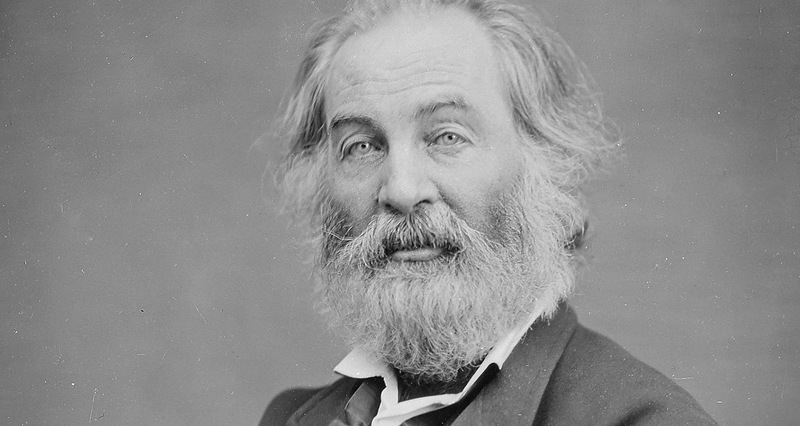 Walt Whitman went to Pfaff’s almost every night between 1858 and 1862 when working on the early editions of Leaves of Grass.2 He occasionally read one of his latest poems to the writers and artists who regularly assembled in this underground beer hall. The free-spirited and unconventional group was brought together by Henry Clapp, editor of the Saturday Press and a champion of Whitman’s work. Other habitués included actor Edwin Booth, painter Elihu Vedder, psychedelic drug pioneer Fitz Hugh Ludlow, cartoonist Thomas Nast, and humorist Artemus Ward, now regarded as America’s first stand-up comedian. And since Pfaff’s was one of the few saloons that welcomed women, Clapp’s coterie was diverse for its time. Writer Ada Clare was a charter member of this artistic clique as was Adah Isaacs Menken whose “naked lady” routine made her the highest earning actress of the era. Given the importance of Pfaff’s, I was thrilled when a menu recently came to light. My first impression was how different it looked from those that previously catered to the city’s literati. This was truly a German menu, reflecting the arrival of new attitudes and foods from Europe. Interestingly, it marked a pivotal moment in our creative past. 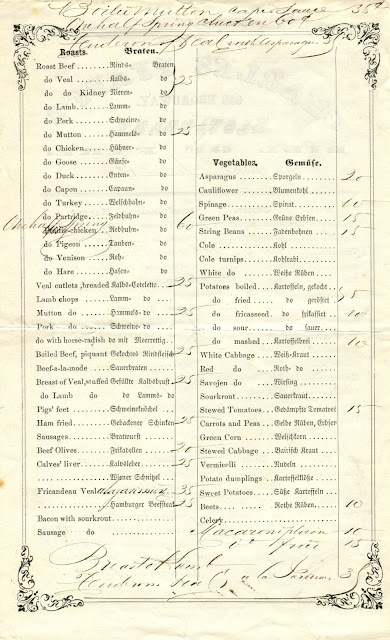 The menu below from June 12, 1866 features mostly traditional German dishes like Limburger cheese, bacon with sauerkraut, potato dumplings, and pfannekucken, a large pancake that was a house specialty. The spring season is reflected by the added specials, such as fresh asparagus, tomatoes, and strawberries, and by the roast chicken that was served in lieu of prairie chicken, a game dish typically available in the fall. The food was reportedly excellent. Another draw was the lager beer. Lighter than the ales and stouts that once dominated the scene in Manhattan, the lagers at Pfaff’s were served cold, a novelty at the time. There was also a very good selection of wines. 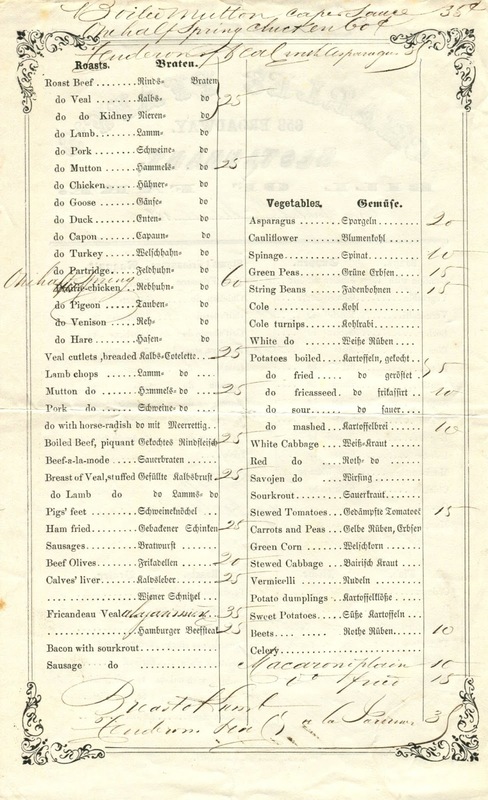 Nevertheless, the back page of this menu is blank, perhaps because the wine and beverage list was too extensive to be shown on a single page. In the mid-1840s, Edgar Allen Poe (the hero of the Pfaff’s set) recited stanzas of “The Raven” to fellow journalists at Welsh’s where the English-based cuisine was advertised with Yankee bombast. 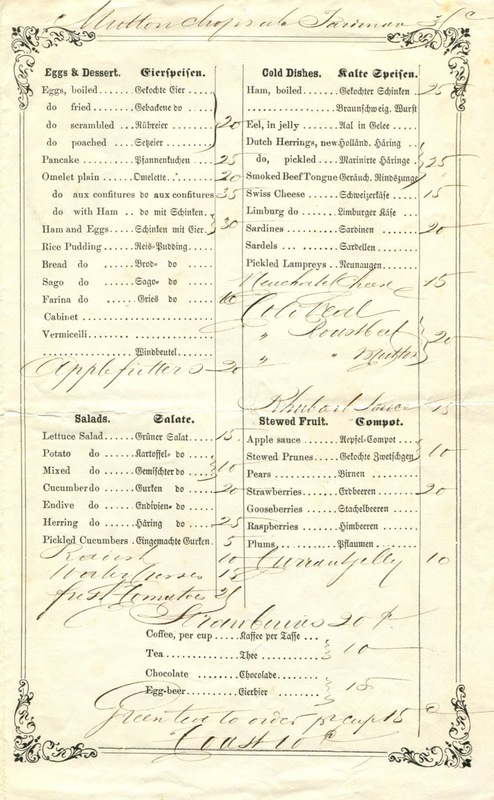 As it happens, the previously-posted menu from this eatery comes from February 1847, when Irish and German immigrants began to pour into the United States, fleeing the potato famines and failed revolutions in Europe. 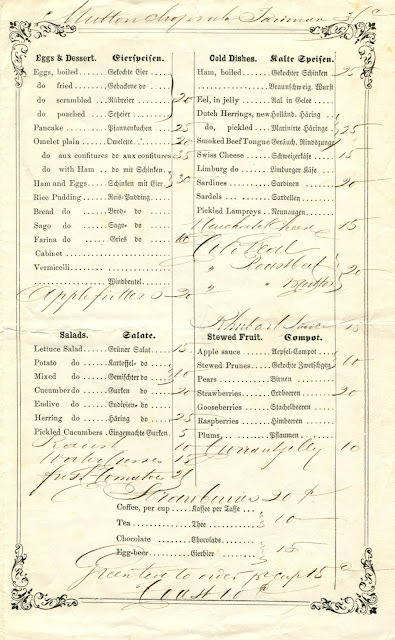 Proprietor Charles Ignatius Pfaff came in the early 1850s as part of this diaspora. And while the influx ignited an anti-immigrant backlash, evidenced by the Native American Party which opposed Catholics entering the country, other citizens were less concerned about the new arrivals. In response to inquiries from its readers, the Saturday Press reported that Pfaff’s was “extensively patronized by young literary men, artists, and that large class of people called Germans.” Indeed, these talented bohemians felt very much at home among the Germans at Pfaff’s. In addition to the food and drink, they appreciated the social tolerance of the restaurateur and the gemütlichkeit of his cozy establishment. Walt Whitman and others in the circle moved away during the Civil War. 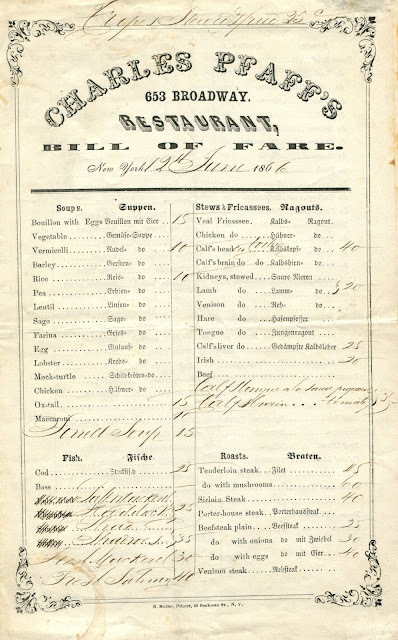 By mid-1864, the beer hall had relocated a few doors to 653 Broadway where those who remained in New York continued to meet nightly at the long table. However, the times were changing. Only ten days before this menu appeared in 1866, the Saturday Press ceased publication, ending its brief post-war revival. Its editor, Henry Clapp, had been the driving force behind the artistic gatherings at Pfaff’s. The closing of his weekly journal marked the end of the first chapter in the history of American bohemianism. What a great write up! That Lehigh University website is excellent.